Reykjavik has its unique and cozy atmosphere due to particular architecture, stunning landscapes and interesting history, walking across the city you would acknowledge many modern art as well: graffiti on walls, cozy and hipster cafes, however, the most iconic and charming feature of the city is stone figures, which determine the "soul" of the city. It was designed by Spanish artist Santiago Sierra and was dedicated to the demonstrations in front of the Parliament that took place during the economic crisis in 2008. The artist donated his sculpture to the city, but on one condition that it would be permanently displayed in front of the Parliament building. Even though the majority of MPs agreed on this condition, the statue still managed to stir some controversy. Some politicians were concerned that the sculpture would become a symbol of violence, although the protest was mostly peaceful, there were some clashes between rioters and police that caused injuries. However, the majority believes that there is a good message in this sculpture as it connects the art and civil disobedience. It was created by Magnús Tómasson in 1992 and is a great satirical work of art that represents the ungrateful, unrecognised job of bureaucratic worker. 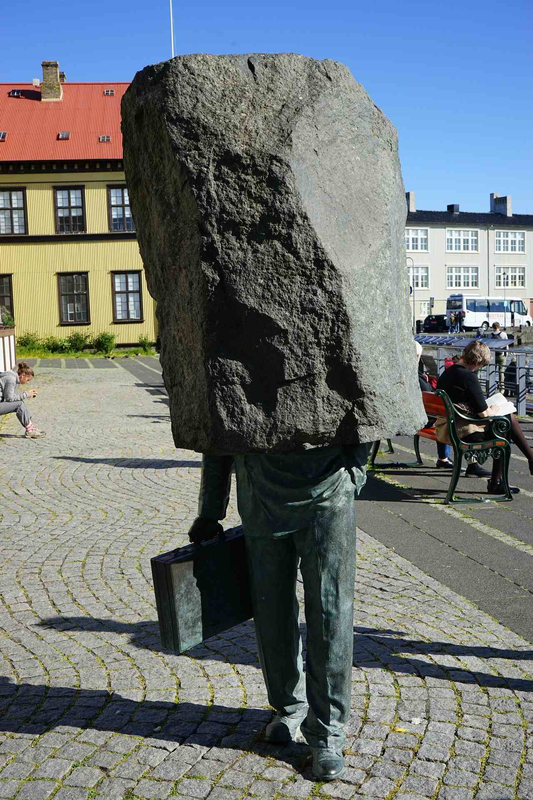 It might be surprising for some people to see such a sculpture, as one might expect the monument to unknown soldier, but definitely not unknown bureaucrat in a suit, with a briefcase in his hand and a huge stone instead of the head. The statue might be not so famous as its counterpart in Copenhagen, but it is still worth seeing. The sculpture that was created by Nína Sæmundsson can be found in Hljómskálagarður park, near City Hall. It is similar to the previous Mermaid sculpture that was 55 years ago and was displayed from 1959 until New Year’s Day 1960, when it was blown up. Mermaid is symbolised Icelandic folk stories, where the creatures were seating on the rocks to attract sailors, who would disappear forever after such encounter.